In order to say why I can’t really write about this I had to do some research. It’s amazing what you don’t read in magazines. The V40 was introduced in 2012 for 2013 and all I noticed about it since then is the daft crease in the bodyside which is supposed to evoque the P1800. The V40 is a hatchback though Volvo describe it as an estate, I suppose. Whilst the designer of the 2004 S40 is probably only named in Auto&Design magazine, the V40 can claim Peter Horbury as its creator (cited at Wikipedia). Some would say the V40 is dynamic and expressive. I find it a design I can’t look at for long as there seems to be so little there, underneath all the details. The predecessor, the 2004 S40 saloon and V40 estate manage to be simultaneously very Volvo indeed and to cleave to a classical Scandinavian modernism of which they might be the best recent exemplars. The S40 wheel arches are gently wider than they are tall but you have measure this to find out. Subtle. The body side is nicely curved and the shoulder line recalls the 240 and 164 without seeming at all slapped on. There’s no wasted effort but the car is not dull. It’s handsome. 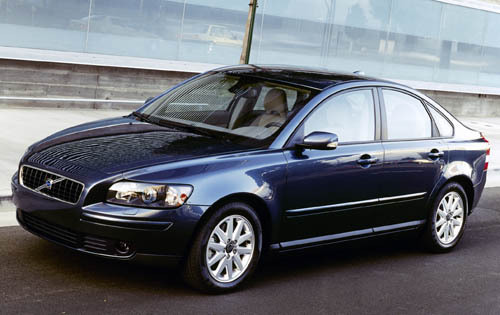 The S40 nods to its ancestors but moves the Volvo line onward. What can I say about the 2014 V40 except that it ends, for now, Volvo’s tradition of medium-sized saloons going back to the most excellent 340 and 360 (leaf springs!). And if you look at Volvo’s website you see that Volvo’s range is more V and X than S. Puzzling. The S40 sold very well indeed. It got nice reviews. Everyone said how good it looked inside and out. The successor turns its back on all that so as offer a pretty useless hatchback format and no possibility of regal saloon travel. Whereas the S40 still catches my eye and pleases me the V40 doesn’t. The range does less than the 2004 S40/V40 did but offers three times as much styling to go about the job. There are dozens of crinkly, swirly over-styled medium sized cars out there. You’d have thought Volvo would and indeed could have resisted climbing that bandwagon. I blame the motoring journalists who never quite get that car ownership is a long term prospect and that the quiet virtues of the 2004 S40 earned it a lot of admiration whereas the fussy dramatics of the 2014 V40 will just make people wonder why it can’t carry a fridge. Why? Because the lamps had to look expressive, that’s why. What do you not read in magazines? That Volvo is not into saloons any more, barring the S80 and S60. A very thought-provoking post (again). I had thought that the current V40 was the offering of Horbury’s predecessor (Steve Mattin?? ), but I also might have lost count, or caring. I was also a big fan of the last S40 and still admire it. I have mixed views about the current V40 – it definitely has its attractive angles, but I’d agree that it lacks authenticity as a Volvo. The S80 has aged very well, and will be missed in these parts when it finally disappears from the listings …. The new XC90 has definite promise and augurs well for the future! You might be right about Steve Mattin being the real author of the current V40. But it´s Horbury that gets the credit. The general iffiness of this car could have something to with Steve Mattin´s short tenure in Gothenburg. I also note that the recent concept car looks much more authentically Volvoid: strong shoulder lines and clean, unfussy surfaces. I have ended up writing about this car, haven´t I? Having worked with the Volvo brand I am familiar with the V40 and have driven one regularly. The current V40 replaced three models in the Volvo range S40, V50 and C30. A big ask, as it is a C Segment 5dr, 5 seater hatchback and was designed as such. The. S40 nor C30 couldn’t compete with the Golf, A3, 1 series et alia, and S40 particularly was bought by the stereotypical Volvo elderly couple that no longer had a need for their small village carrying 850. The V50 was bought by people who needed a small estate didn’t want a Golf (German) or Focus (common). The C30, although a pretty thing, appealed to a very limited audience being a 4 seater with the boot capacity of a nun’s purse. Volvo sit in a bit of a limbo position in the marketplace, hovering between VW, Toyota and so forth and the Premium Brands, and V40 was the first car to attempt to move the Volvo closer to that premium brand perception. Unfortunately to continue making cars you need to sell them and this market is an important one for them to succeed in. I think the V40 is a fine effort in that respect.. There is no room or sense in putting a saloon car in that market. Unless you are a 3 Series or A4 fan, small-ish saloons just don’t sell in the UK. Volvo dealerships can’t give S60’s away on a buy one get one free basis and S80 really has no idea what it is and nor does anyone else apart from the occasional low rent chauffeur (Oh and the Chinese seem to be very fond of it). Good car but its tired and it looks it. Dynamically the V40 drives extremely well, handling sharp and ride on the right side of compliant. it is shy of boot space and rear legroom and maybe even too narrow, but Interior quality is a huge leap forward and this car has spearheaded the companies fundamental principal, to make it practically impossible to be killed or seriously injured in, or by a Volvo by the end of this century. The new XC90 will take this to the next level. If we are purely focusing on design, well maybe I have spent more time looking at this car having driven one for a time but I think its a handsome thing and the more time I spent walking up to it the more I enjoyed doing so. It does not look like every other 5dr hatch out there and it has more in common stylistically with the P1800 than just the shoulder line flick, especially the font end and grill. I was never a fan of S40 and always thought the rear particularly looked rushed and consequently compromised. Like the V40 could not get a fridge in the boot….with or without its rear lights attached.